MDC leader, Nelson Chamisa has again slammed ZEC insisting that the elections body is desperate to guarantee a Zanu PF win. 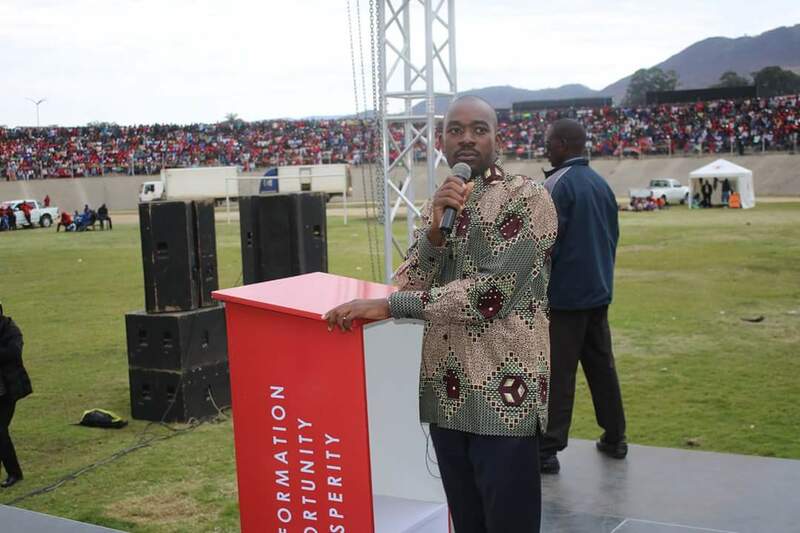 Advocate Chamisa who was in Mutasa and Hauna in Manicaland Province yesterday as part of the NDC Alliance campaign programme said he is not ready to have the Zimbabwe Electoral Commission (ZEC) supervise the country’s elections alleging there is a conspiracy to guarantee that Zanu PF wins the 2018 elections. “We wanted to have the people’s photographs on the voters roll. We have had Zanu PF manipulate the ballot paper and have won previous elections because of that. We want to be there when the ballot papers are printed. We have written to SADC as well as the African Union before elections can be held so that this stipulation can be upheld,” he said. Ironically Chamisa was responsible for the selection of the ZEC commissioners as deputy chairperson of the Parliamentary Portfolio Committee responsible for selecting the commissioners. At Sakubva Stadium today Advocate Chamisa told the crowd that once elected into office he will change the country’s name from Zimbabwe to Great Zimbabwe. “The first thing that must be changed is the name of the country. Zimbabwe will not remain as Zimbabwe. The name that we have is associated with bad luck. Even when it comes to sport our teams whether be it football or cricket or volleyball are always losing. We want to retain the status of our country with a new name,” he said. Alliance partner Tendai Biti confirmed the widely held notion that the Alliance is a front for some hidden forces as he revealed they have western backers waiting in the wings to bring wheelbarrows of money once they get into power. “I was with Chamisa in America in December. I was in Chamisa in London in May where our backers said go and win finish up the work that you have been doing, on the first of August we will bring dams as well as wheelbarrows full of money to kick start closed firms,” he said.